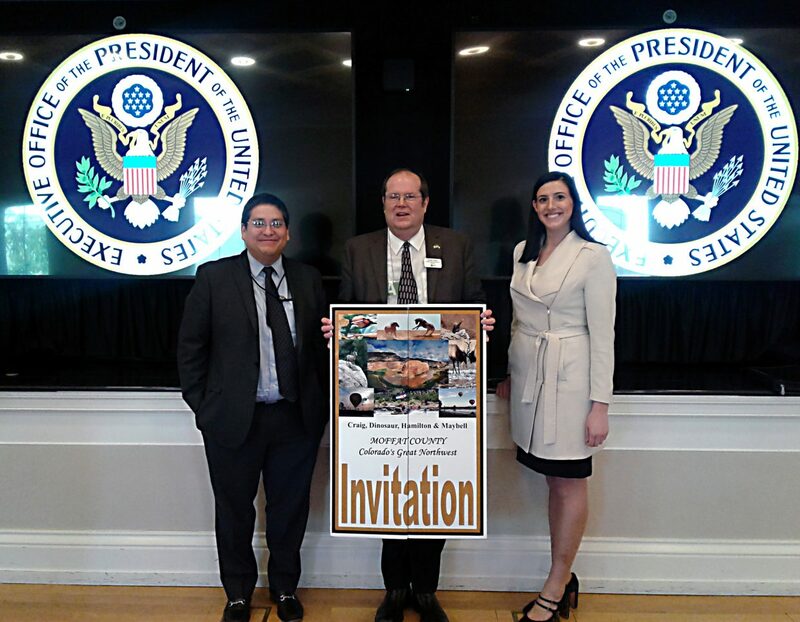 Moffat County Commissioner Frank Moe, center, poses with an invitation asking President Donald Trump and the First Family to visit Craig and Moffat County. The invitation was delivered to William Kirkland, left, special assistant to the president, and Rosalyn Leighton, right, a regional political director in the White House Office of Political Affairs. CRAIG — Moffat County Commissioner Frank Moe travelled to Washington D.C. this week to meet with White House representatives. Moe also delivered an invitation to President Donald Trump and First Family, inviting them to Craig and Moffat County. Representatives from several federal agencies spoke, including the Department of Transportation, Department of Agriculture, Department of Housing and Urban Development, Department of Energy, National Economic Council, Department of the Interior and an assistant to the president.